Presidential candidates obsess every four years over swing states like Florida and Pennsylvania, where undecided voters can make or break their campaigns. For tech companies like Airbnb, Facebook and Uber, those states appear to be proving just as tough — and critical — to make a dent politically. In a poll conducted at the end of April, Republican consultants with the firm Firehouse Strategies found that broad swaths of the likely voters they surveyed in Pennsylvania, Ohio, Florida and Wisconsin haven’t really made up their minds about these three tech giants. And some of the roughly 3,500 total Democrats and Republicans who responded to their questions expressed particular concern with Facebook, which they said should be subject to more government scrutiny. Pollsters specifically asked if Facebook should “face more oversight from the federal government.” They cited recent controversies around issues like “fake news” as well as an incident in Cleveland, Ohio, in which a Facebook user uploaded a video of a homicide. While more than 36 percent responded that Facebook warrants more attention by regulators in the nation’s capital, about the same percentage of participants said it shouldn’t — with the remaining 26 percent still unsure. For Facebook, its challenges appear to be older adults and Republicans. Nearly 40 percent of those over the age of 55 believe Facebook deserves greater government oversight. The GOP pollsters behind the study also noted in their analysis that Facebook probably can’t count on political support from their own party, either. They found that 39 percent of Republicans who replied to their poll want the government to pay more attention to the company. Firehouse Strategies, which worked with the data analytics team at 0ptimus, also explored public support for companies like Uber and Airbnb. 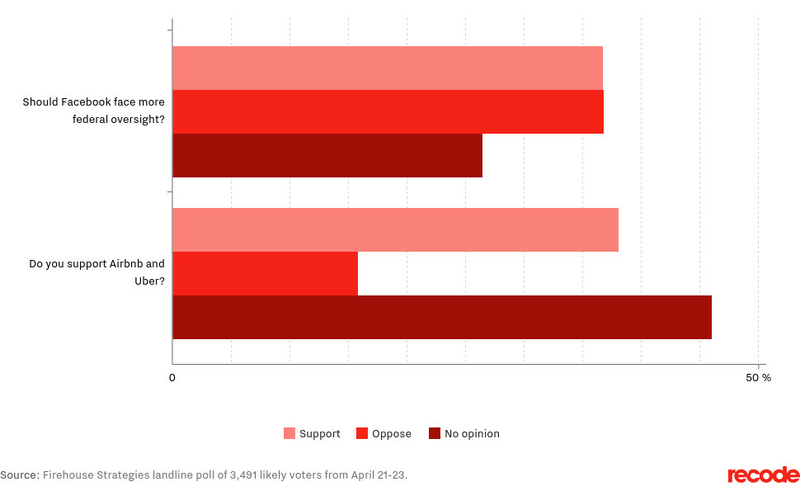 Roughly 46 percent of voters who responded said they didn’t have much of an opinion of either tech giant, even though states that the firm surveyed — like Florida and Pennsylvania — have found themselves in pitched political battles with local regulators in recent years. “People are still making up their minds on whether companies like Uber and Airbnb benefit consumers or undermine jobs and public safety,” the firm concluded in its report.